sharisharishari were invited to participate the “living space” exhibition along with other 4 exhibitors. 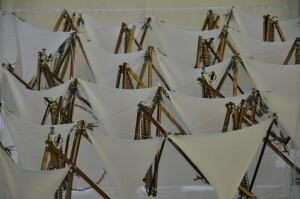 The exhibition will be held at the So Far, the Future gallery in Russel Square London WC1N 3LH, 25th June – 1st July 2012. MON-SUN 12:00-6:00PM. Click the invitation below for further information of the venue. 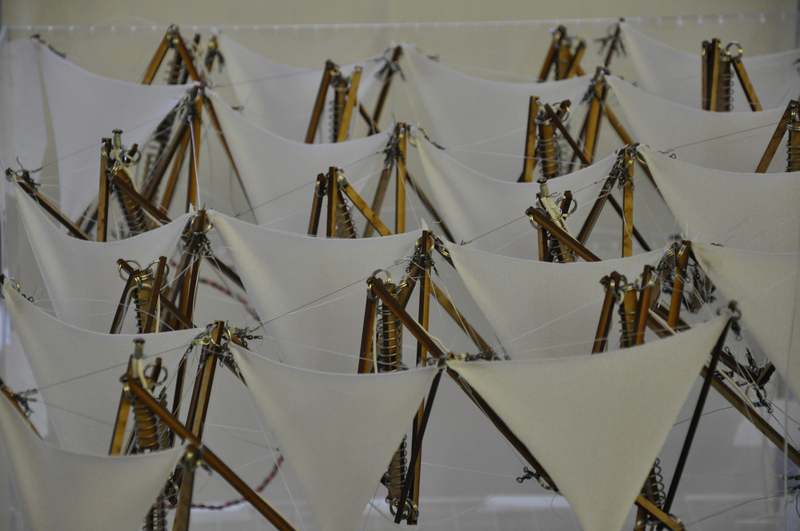 We will be exhibiting the latest development of the Kinetic Tensegrity Roof – The Roof of Modality. An exhibition exploring biomimicry and bio-inspiration in architecture, through materials and installations that grow, decompose, sense and respond to their surroundings. 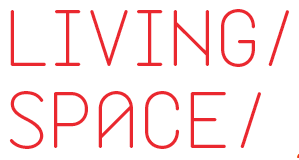 Living Space is an exhibition showcasing materials and installations that grow, decompose, sense and respond to their surroundings. 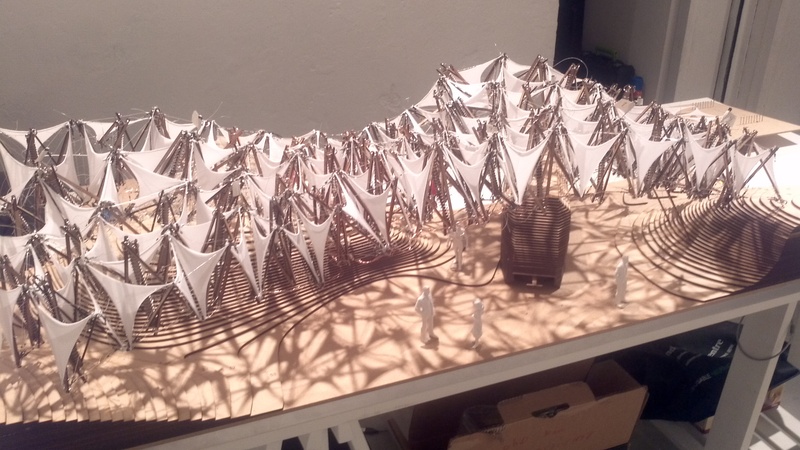 Through the examination of biomimicry and bio-inspiration in architecture this project celebrates the work of contemporary architects and designers, and the methodology and materials used to explore their ideas. 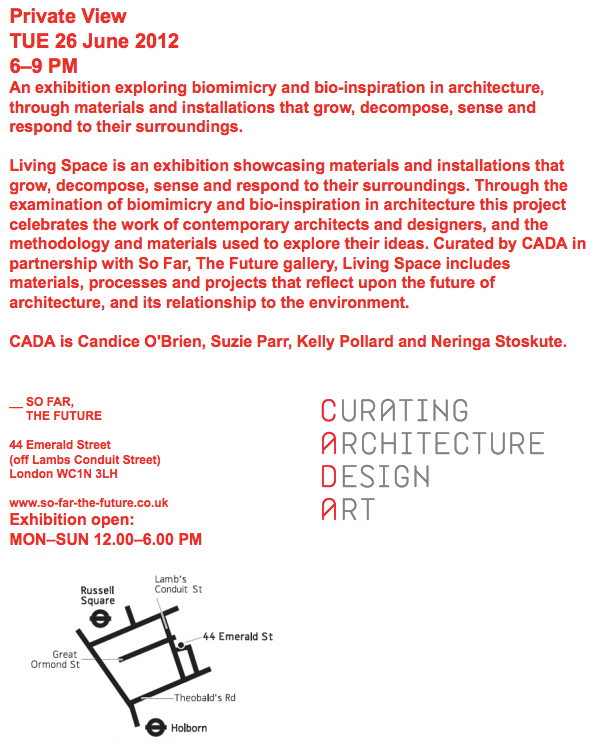 Curated by CADA in partnership with So Far, The Future gallery, Living Space includes materials, processes and projects that reflect upon the future of architecture, and its relationship to the environment. 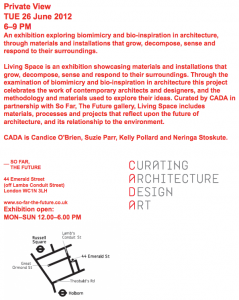 CADA(Curating Architecture Design Art) is Candice O’Brien, Suzie Parr, Kelly Pollard and Neringa Stoskute. 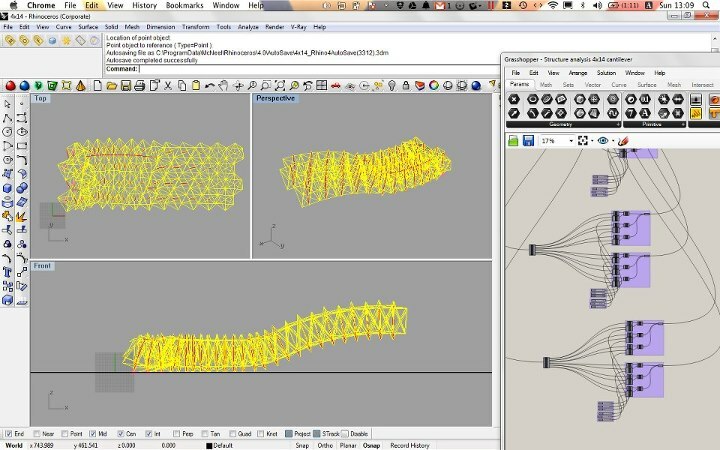 In this research Tensegritic-Intelligent Canopy introduces a new strategy for intelligent architecture defined as a multi-scaled system that communicates with agents, i.e. humans and environments, through both software and hardware and has the ability to change its rules during its interaction with the agents. Each individual component within the system has the ability to compute data and as a result, the component changes its physical behavior. The greater the adaptability of the rule, the higher the computability. 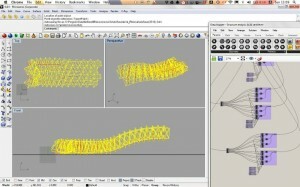 Architectural agent is defined as an intelligent machine that integrates numerous computers dedicated to sensing-calculating-actuating, each making its own decisions in order to produce an interactive interface between machine and human and machine and machine. 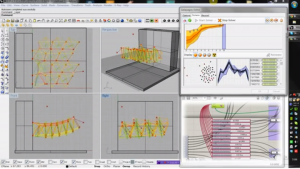 True adaptability requires dynamic hardware and software systems to provide functions such as input, evaluation, output. ShariShariShari is a designer association based in London UK, China, and Japan. The association was established in summer 2010 by designers and students from architecture and information technology. They are capable of designing and researching in a wider range, backed by their various experience and knowledge from cutting edge academic researches to master planning and working architectural details.